Tony is the a balding middle‐aged man with a comb over, mustache, and hairy chest. Tony is met wearing a violet open dress shirt, navy pants, and apron. He also has a golden cross necklace, gold rings and bracelet. Tony is a charismatic, friendly man who loves his wife and enjoys his work. 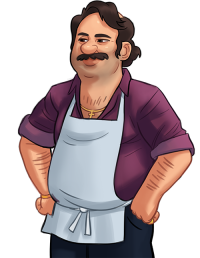 Tony owns and runs with his wife Maria a pizzeria called Tony's Pizza.